The translation of the Bible which we use at Emmanuel is the New Revised Standard Version (NRSV). The ecumenical NRSV Bible Translation Committee consists of thirty men and women who are among the top scholars in America today. They come from Protestant denominations, the Roman Catholic Church, and the Greek Orthodox Church. The committee also includes scholars from the Jewish tradition. The RSV was the only major translation in English that included both the standard Protestant canon and the books that are traditionally used by Roman Catholic and Orthodox Christians (the so-called “Apocryphal” or “Deuterocanonical” books). Standing in this tradition, the NRSV is available in three ecumenical formats: a standard edition with or without the Apocrypha, a Roman Catholic Edition, which has the so-called “Apocryphal” or “Deuterocanonical” books in the Roman Catholic canonical order, and The Common Bible, which includes all books that belong to the Protestant, Roman Catholic, and Orthodox canons. 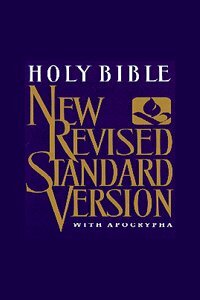 The NRSV stands out among the many translations available today as the Bible translation that is the most widely “authorized” by the churches. It received the endorsement of thirty-three Protestant churches. It received the imprimatur of the American and Canadian Conferences of Catholic bishops. And it received the blessing of a leader of the Greek Orthodox Church. Our readings in the Church of England at the Eucharist on Sundays follow the ecumenical REVISED COMMON LECTIONARY, used by the majority of churches in the Western tradition. These can be found by clicking on this link provided by the Episcopal Church of the United States of America.